I noticed on Facebook a couple of days ago that the HarperTeen page was asking readers which they preferred: series or standalone novels. I don't necessarily like how this question is broken down into an either/or statement because it's a lot more complicated than picking one or the other. I think that the first thing to be considered is the story. Some stories need to be told in multiple books. It allows you to get into the details and really go in-depth into the story, the characters, the conflict. Some conflicts are so huge and the solutions so extensive, they can't be contained in one book. And when you have a story, or characters, or a setting that readers love and just can't get enough of, then having a series is so awesome and fun. I love the excitement and the community that reading a long series builds. But if anything, the excess of trilogies and new series in the past few years has taught me a great appreciation for the standalone novel. I love a thick standalone novel, where everything is contained in one book with a satisfying ending that doesn't make me want to cry because I NEED TO KNOW WHAT HAPPENS NEXT, DAMMIT. 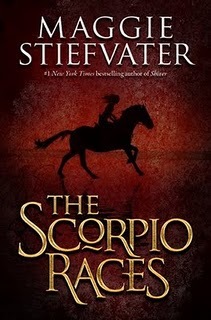 Maggie Stiefvater's The Scorpio Races is one of the best standalone novels I've read in ages, and even though it isn't the longest book on my shelves, I absolutely love the progression of the story and the ending. Stiefvater creates a world that you don't want to leave, but at the same time, by the time you get to the final page, the story is done and you just can't drag it out any longer. I wish that there were more books like The Scorpio Races, and I'll admit that part of this isn't because of the masterful storytelling, but because my attention span is short and my time limited. Most books in a series have a year between them (though I have noticed that some publishers, like Random House, have started spacing series out in nine-month spans, which I really like). Unfortunately because of school, work, life I can't re-read every book I loved before the sequel comes out, and if I feel like I don't remember a book well enough, I'll put off the sequel. Another interesting fact to note: Why is it that a paranormal/fantasy/dystopia story tends to be told in multiple books, but you have to look harder to find a YA contemporary series? What are your reading habits? Do you follow a lot of series, start and not finish them, or tend to read more standalone books? Or do you avoid series until all of the books are out and you can read them all at once? I love a good standalone novel and I love some series. I like some trilogies, but I don't like those that feel forced--those where the author didn't come up with an intricate enough plot to warrant three books. If the character is compelling enough, I love following that character through many adventures. Definitely, and I feel silly now for not mentioning it, but I LOVE Richelle Mead's Vampire Academy series. I think this is partly because it's evident that Mead really did an excellent job keeping so many plots and subplots in order. There are some many little conflicts going on in each book, and a few major conflicts that follow multiple books. Also, Penguin didn't take 6 years to put out a 6 books series, they paced it out in like 6-10 month increments. I love both. But it all depends. There are some stories that fit into a stand alone and are meant to be that way. And others that just need more time. So I'm okay with either, but I hate when a story that fits into a singular book gets broken down, usually for comercial purposes. Or when too much of a story gets crammed into a book. As long as it's handled well, I'm okay with either. I love series, because I get to spend lots of time with the characters. But lately I've wanted to read more standalones, partly because many series I've been reading seem bloated, rather than having a good premise for multiple books. I agree, I think it really depends on the story. I don't think that publishers should shy away from long books, though. Vampire Academy is extraordinary. I'm actually rereading Last Sacrifice right now. So I guess the answer is, Series=yay. Series that come out quickly=YAY! you know i completely agree with you...i love series because you get more of the characters, more back stories, more development. but if the author does the job right you can get the full reading experience in a stand alone. there's no way i could pick one of the other. Like you I am torn. Your stand alone pick is one of the best I've ever read as well. I think Maggie in general is the exception. She can write an amazing stand alone and then whip out some pretty amazing series too. So, for me, I think it comes down to the author and their writing style. I have what feels like a million series that I follow. I am guilty of putting off sequels until I have two books to read at a time. Or at least hording those really good series that I know I will love, keeping them for when I need that fix. I too would love some good contemporary series. I've seen a few good ones such as Simone Elkeles' and Miranda Kenneally. Although, there are some pretty atrocious series out there that I have departed from or ignored completely. I think making things a series is a publisher or authors attempt to be the next Twilight. I don't blame them for trying but they should really try their best. A great series is something I will always be striving to find. I have found a few and will love them and share them forever. I read this blog AFTER I read the blog about Libby Bray's new series. As I was reading THAT blog I was thinking, "Libby Bray, yay! A series, no!" as I really, really, dislike waiting to see what happens. So much so that I sometimes wait until #2 comes out so I can read one right after the other! I also wish there were great stand alone novels in non-contemporary genres! But I do love a trilogy (any more than that and you start to lose me!). I'd be torn as well. There are certain series I love but I have to admit I am getting tired that it seems like almost every new YA paranormal book is part of a series. It works for some but there are some I wonder if they really needed to be divided into multiple books. And I thought Vampire Academy stretched on too long. I think when I first went to a Richelle Mead signing she mentioned the series was supposed to be just 4 books but then she signed on for more. I thought it showed that it was stretching out longer than it should have.